The terms photopic, mesopic and scotopic refer to three ranges of human vision adaptation level, which differ in anatomical response, spectrum and their effect on visual acuity. The Illuminating Engineering Society of North America (IES) has incorporated these effects into its lighting recommendations for low light levels, found in the IES Handbook (10th Ed.) and in TM-12-12, Spectral Effects of Lighting on Visual Performance at Mesopic Lighting Levels. The terms photopic, mesopic and scotopic have been getting a lot of play in recent years, though sometimes they have been used inaccurately. They are important concepts, and their understanding may influence lighting design and calculations. These terms refer to the primary use of the cones, rods, and/or other light sensitive cells on the retina of the human eye. The cones cover most of the retina, but their greatest concentration is at the fovea, the center back of the eye. They are packed very closely there, giving us fine visual acuity when we look directly at something, analogous to high pixel concentration on your computer monitor. They are less dense away from the fovea, giving us less precise peripheral vision. There are three kinds of cones, designated the long-wavelength, medium-wavelength and short-wavelength cones, formerly call the red, green and blue cones, respectively. In combination they are responsible for giving us color vision. The cones are most active in medium and high light levels. As the general environmental brightness drops, the cones become less effective and it becomes difficult for us to discern fine details and colors. The rods are primarily responsible for giving us peripheral vision and providing information about contrast and movement. There are no rods at the fovea of the eye, but they cover the rest of the retina in greater concentration than the cones. The rods become overwhelmed with high light levels, but at low light levels, they are more active than the cones are. Photopic: This term refers to cone vision and generally covers adaptation levels of 3 cd/m2 and higher. Adaptation level is the overall brightness of your environment that your eyes have adjusted to. Translated into illuminance, if the average reflectance of your environment is 30%, an adaptation level of 3 cd/m2 (candelas per square meter) would result from illuminance of approximately 3 footcandles (30 lux). The combined peak sensitivity of the cones is at 555 nm, in the yellow-green part of the visible spectrum. (See red curve in figure.) The lumen, the basic metric of visible light, is defined by the combined cone response only. Mesopic: This term refers to a range of human vision with both rods and cones active. There is no hard-line transition at either end, but for most intents and purposes the mesopic range is generally considered to be from 3 cd/m2 down to 0.01 cd/m2. Scotopic: This term refers to rod vision and corresponds to an adaptation level below 0.01 cd/m2. The peak sensitivity of the rods is at 507 nm, in the blue-green part of the visible spectrum. (See blue curve in figure.) While there may be some (very little) cone activity at 0.01 cd/m2, once the light level drops to 0.001 cd/m2, only the rods are active. At this point, the ability to discern colors is gone. In addition, since there are no rods at the fovea and the cones there are not receiving enough light to be stimulated, the ability to discern fine details is gone. This light level is what you will find on a moonless night out in the desert, far from any town or highway luminaires. Drive out, turn off the car lights, and wait for your eyes to adapt. With light only from the stars overhead, you will be able to see large objects like boulders and shrubs and perhaps a rabbit scampering by. But no colors, and you can't read the newspaper! Because of this difference in spectral sensitivity, the lumen, defined according to the cone response only, is not a very good measure of visibility at low light levels. As the light level drops, our peak visual sensitivity shifts toward the blue end of the visible spectrum. For most nighttime applications, it is in the mesopic range, with the peak being somewhere between yellow-green and blue-green. The lower the light level, the greater shift away from the photopic sensitivity curve. Research has found that white light that is "cool" in appearance, with more energy in the short-wavelength (blue-violet) part of the spectrum, appears to be brighter than white light that is "warm" in appearance, with more energy in the longer (orange-red) part of the spectrum. In general, the higher the Correlated Color Temperature (CCT) of a light source, the "cooler" it appears. Sometimes this kind of light source is called "scotopically enriched," meaning there is greater stimulation of the rods. An example of this effect is that, given equal illuminance, a space lighted with a "cooler" appearing light source will appear brighter to human eyes than the same space lighted with a "warmer" appearing light source. Research has also shown that at medium-to-high (photopic) light levels it is easier to discern small details under a light source that has more blue in the spectrum (cooler in appearance). This effect may be helpful for people doing inspection, surgery, sewing, and other detail-oriented visual tasks. It turns out, however, that these effects aren't due to the rods after all, but to a different kind of light-sensitive cell on the retina, called intrinsically photosensitive retinal ganglion cells (ipRGCs), which have a peak sensitivity in the blue part of the spectrum, not far from the rods' peak sensitivity. 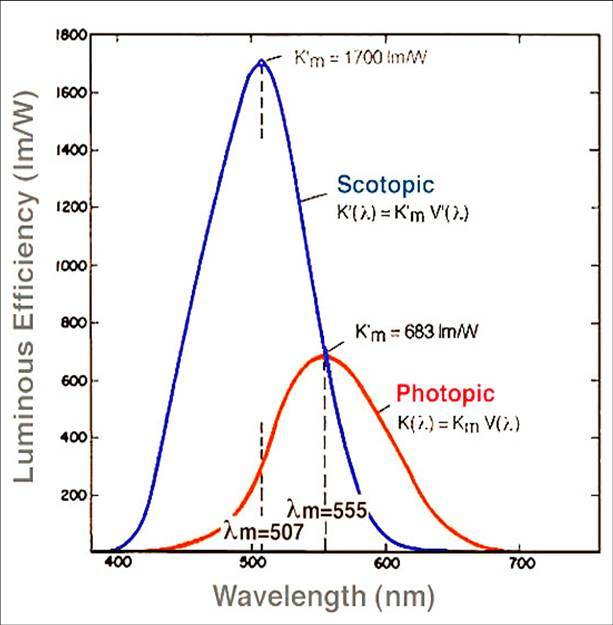 Finally, in several experiments at mesopic light levels, researchers have compared foveal vision and peripheral vision under HPS and MH luminaires at mesopic levels. They found that the color of the light source didn't affect direct vision, the ability to see details when looking directly at the object. However, in a simulated roadway application (no vehicles to run over the subjects!) where they tested peripheral vision, they found that the subjects had faster reaction times under MH than under HPS, all other conditions being equal. Unlike the effects found at medium and high light levels, this is a rod effect; the rods, most responsible for our peripheral vision, are more sensitive to the "cooler" wavelengths of the MH lamp. All of this can, therefore, affect a designer's selection of light source. In addition to considering "how much light? ", he or she needs to consider "how bright in appearance? ", "is the ability to see fine details important? ", and "is peripheral vision important? ", not to mention the many esthetic considerations that may be relevant to the project. It is important to note that photometric reports from luminaire manufacturers provide lumen and candela values that are, by definition, based on the photopic response only. As mentioned above, the IES document TM-12-12 provide guidance for lighting design for mesopic light levels, taking into consideration the spectrum of the light source. For medium and high (photopic) lighting levels, an upcoming document, TM-24-12, Incorporating Spectral Power Distribution into the IES Illuminance Determination System for Visual Task Categories P Through Y, will provide guidance for lighting designs at photopic levels when the visual task requires the ability to discern visual detail. Some lighting designers and other specifiers are designing to lower illuminance levels when using high-CCT (5000K+) light sources. Many end users have found these designs acceptable, while some have found the appearance to be "cold," especially with CCTs above 6000K. Obviously, when humans are involved, it can be difficult to find one solution that suits everyone. The balance of visibility, energy, cost, esthetics, and all the other factors to be considered in lighting design is a complicated one to achieve.